In given figure we can see two groups of different frequencies. When one upper and one lower frequencies mixed then a tone is created and that tone we call Dual Tone Multiple Frequency. 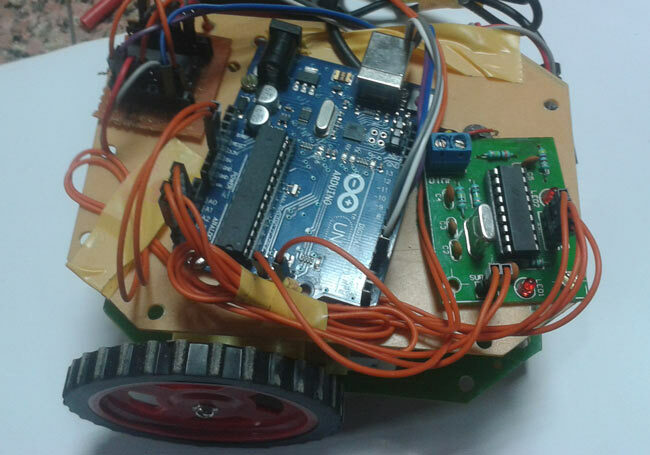 Circuit digram for Arduino based DTMF Controlled Robot is very similar with our other robot like PC controlled robot, Line Follower, Gesture Controlled Robot, etc.. Here one motor driver is connected to arduino for driving robot. Motor driver’s input pin 2, 7, 10 and 15 is connected at arduino digital pin number 6, 5, 4 and 3 respectively. Here we have used two DC motors to driver robot in which one motor is connected at output pin of motor driver 3 and 6 and another motor is connected at 11 and 14. A 9 volt Battery is also used to power the motor driver for driving motors. A DTMF decoder attached with this circuit and this decoder is plugged into a mobile using an aux wire for receiving command or DTMF Tone. DTMF decoder pin D0-D3 is directly connected with Arduino’s pin number 19,18,17,16. Two 9 Volt batteries are used to power the circuit in which one is used for power the motors, connected at motor driver IC pin number 8. And another battery is connected to power the remaining circuit. DTMF controlled robot run by some commands that are send via mobile phone. We are here using DTMF function of mobile phone. Here we have used the mobile phone to show working of project. One is user mobile phone that we will call ‘remote phone’ and second one that are connected with Robot’s circuit using aux wire. This mobile phone we will call ‘Receiver Phone’. When we presses ‘2’ by remote phone, robot start to moving forward and moving continues forward until next command comes. When we presses ‘8’ by remote phone, robot change his state and start moving in backward direction until other command comes. When we press ‘4’, Robot get turn left till next command exicuted. When we press ‘6’, robot turned to right. And for stopping robot we pass‘5’. In program first of all we have defined output pins for motors and Input pins for DTMF decoder output as in INPUT for Arduino. And then in setup set motor pin as OUTPUT and DTMF decoder output pins as INPUT. After that we read DTMF decoder output and then compare with defined values by using “if” statement and perform relative operation. We write program according to above table conditions. Where can i bay this DTMF-Module? You can buy a DTMF module from your local hardware shop or there are various websites like ebay from where you can buy it online. You have to buy from "Amazon.In". Interesting project. However, there seems to be a big gap in the area of getting the audio signal from the cell phone to the DTMF module. " an aux wire is needed" does not explain much. If you notice carefully, there is another cell phone, that is placed on the Robot and AUX wire has been used to connect that cell phone to DTMF module. Just click on the Circuit Diagram, it will get enlarge and opens in new Tab. Use Arduino IDE software (Arduino Nightly : https://www.arduino.cc/en/Main/Software) to burn the code into Arduino. Projects is properly tested, check you circuit connections and use mentioned components. D0,D1,D2,D3 are for DTMF module, not for Arduino. Code means D0,D1,D2,D3 of DTMF module are connected to Arduino pins 19, 18,17,16. Please read the Description, Code and Circuit before comment. Code is correct, please check your circuit connections. No need of programming for dtmf ic .So feed yr program in ardino (burner port). tell about RPM speed of dc motor(150 or 200) and dc supply. DTMF module has connector to connect the two wires from 3.5 mm audio jack. Further you can check wires of 3.5 mm jack in this article: Small Loudspeaker for Computer or Cell Phone You need to connect Ground and Left/right audio wires from audio jack. i cant find DTMF module in shops in my city ,, but there is MT8870 ic only ,, can i use it only ??? ,, or it should be programmed first ??? I have one question in my mind.. You are using analog pins A2 - A5. and in void loop you are reading data digitally.. how is it possible? Analog pin only takes analog input and dtmf module decodes input digitally. So digital data should be read by Arduino. You can use analog pins in digitalRead()/digitalWrite() function in Arduino to read or write digital data. You are saying that the output of dtmf module is digital, but how you are connecting it with analog pins of arduino?? Is it work properly ? . i want to make the calling using sim900A module as well as control using dtmf command set. in this ..in l298d module both en1 and end are connected to +5v volt..is it corret ? how to connect aux cable with DTMF and mobile phone. and which type of cell phone use for this project . tnx . you are best !!! How to use in project of DC motor ? How many Voltage in DC Motor ? Is it possible to get vedio feedback from receiver phone to controller phone??? I want to get vedio feedback from attached Android mobile phone to calling Android mobile phone, by using skype vedio call. Is it possible, if i use seme circuit diagram and same ardiuno code?? Plz replay.. its very urgent. In the circuit diagram where should I connect the mobile phone using audio jack? In the circuit diagram the DTMF module is shown as a block. The actual DTMF module will have a audio jack pin to which the mobile phone can be connected. 1. Do we use a 3.5mm TRS Aux cable to connect the DTMF Module to the Receiver phone? 2. Will this project work with this MT8870 Module? 3. Can you please explain "attend the call by manually or automatic answer mode" in more detail? I'm using a Samsung S6 for the remote phone. Would a Nokia 130 work ok for the receiver phone? Could you "whistle" the dtmf tones into the remote phone? All those r very gud concepts but hw I can download the PDF of particular projects???? i am using l298n driver .....we have give the connections for enable or it will work without enable connections..?